Blessed John Henry Newman comments on Mary’s title Mirror of Justice telling us that by “justice” we do not mean what is understood in ordinary English; instead we mean “all virtues at once, a perfect, virtuous state of soul—righteousness, or moral perfection; so that it answers very nearly to what is meant by sanctity.” And Mary reflects like a mirror the holiness of the one with whom she lived with for close to thirty years. Holy Mary, Mirror of Justice, you reflect Jesus even more beautifully than the moon reflects the rays of the sun, pray for us that we too may be a mirror of your Son. HERE first we must consider what is meant by justice, for the word as used by the Church has not that sense which it bears in ordinary English. By “justice” is not meant the virtue of fairness, equity, uprightness in our dealings; but it is a word denoting all virtues at once, a perfect, virtuous state of soul—righteousness, or moral perfection; so that it answers very nearly to what is meant by sanctity. Therefore when our Lady is called the “Mirror of Justice,” it is meant to say that she is the Mirror of sanctity, holiness, supernatural goodness. Do we ask how she came to reflect His Sanctity? —it was by living with Him. We see every day how like people get to each other who live with those they love. When they live with those whom they don’t love, as, for instance, the members of a family who quarrel with each other, then the longer they live together the more unlike each other they become; but when they love each other, as husband and wife, parents and children, brothers with brothers or sisters, friends with friends, then in course of time they get surprisingly like each other. All of us perceive this; we are witnesses to it with our own eyes and ears—in the expression of their features, in their voice, in their walk, in their language, even in their handwriting, they become like each other; and so with regard to their minds, as in their opinions, their tastes, their pursuits. And again doubtless in the state of their souls, which we do not see, whether for good or for bad. Now, consider that Mary loved her Divine Son with an unutterable love; and consider too she had Him all to herself for thirty years. 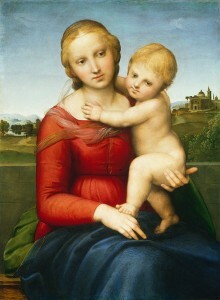 Do we not see that, as she was full of grace before she conceived Him in her womb, she must have had a vast incomprehensible sanctity when she had lived close to God for thirty years?—a sanctity of an angelical order, reflecting back the attributes of God with a fulness and exactness of which no saint upon earth, or hermit, or holy virgin, can even remind us. Truly then she is the Speculum Justitiæ, the Mirror of Divine Perfection. Reflection on “Mary Mirror of justice” is very very clear in thoughts and words for any common man to understand.Thank you dear fr.